October is Try New Foods Challenge month! For the first week, I tried two foods that I’d never tried before: yucca (or is it yuca?) root and plantains. 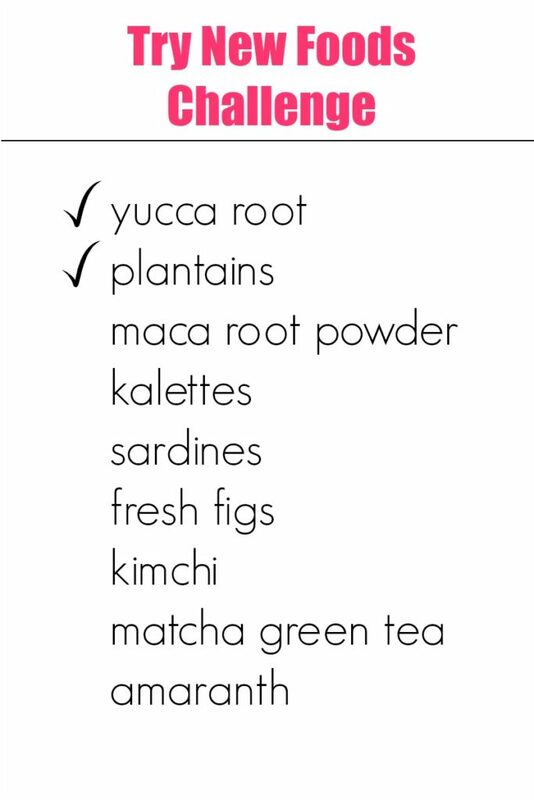 First up was yucca root. 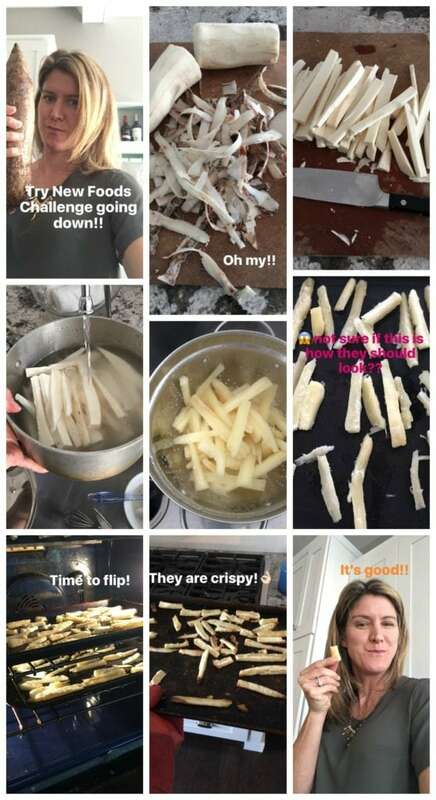 I followed The Healthy Maven’s recipe for Crispy Baked Yuca Fries. I didn’t follow her recipe exactly because the kids prefer plain salt seasoning and I wanted them to try them. Luke, Tim, and I all loved this and Meghan thought they were okay. I was pleasantly surprised at how crispy they got! I’ve never gotten a potato of any kind to get crispy like this in the oven. It tasted similar to a potato, but had its own unique flavor. Yucca root is good for your cardiovascular health and also has anti-inflammatory benefits. I’m so glad I tried it and will now include it in my diet often. If you have any great recipes, please share them in the comments! The second new food I tried was plantains. I tried this recipe for Sweet Plantain Hash & Eggs. 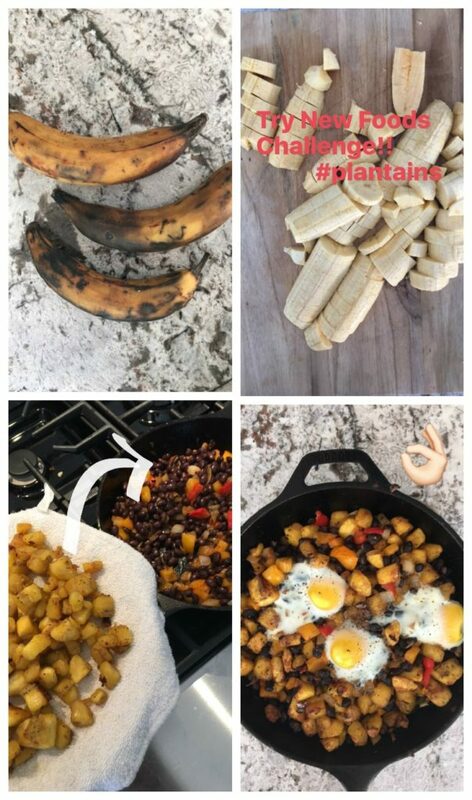 This was super tasty–I loved how the sweet plantains mixed with the rest of the savory hash ingredients. I tried to get Meghan and Luke to try the plantains that were lightly fried in coconut oil before I added them to the hash, but they were not interested one bit. I guess getting them to try one out of two new foods for the week is not bad. Plantains are a great source of vitamin C, vitamin A, potassium, and magnesium. I’ll keep this new-to-me food in my line-up as well! Even though I have tried a good deal of the healthy foods available in grocery stores today, I’m excited to work my way through this list and expand the variety in my diet even more. There’s more that that, though. I hope I am inspiring YOU to try new foods. Not only is it great to expand the foods you eat for maximum nutritional benefits (eating the same foods over and over can severely limit the nutrients you’re getting! ), but it’s also fun to learn how to cook new things. Helping you is so much why I’m here, so I hope this challenge is helping you on your journey of health. If you tried something new this week, please let me know how it went!